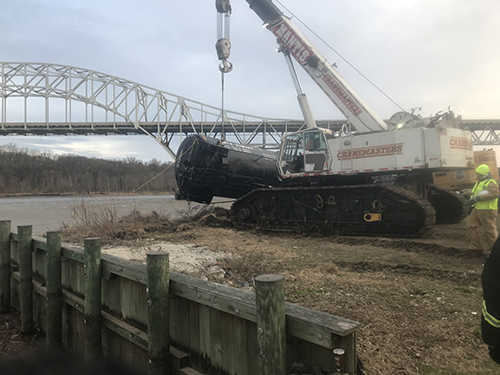 MARCH 9, 2018 — A CSX train derailed on a bridge over the Susquehanna River, adjacent to Havre de Grace, Maryland, on Friday evening, March 2, causing four empty rail cars to fall into the river. 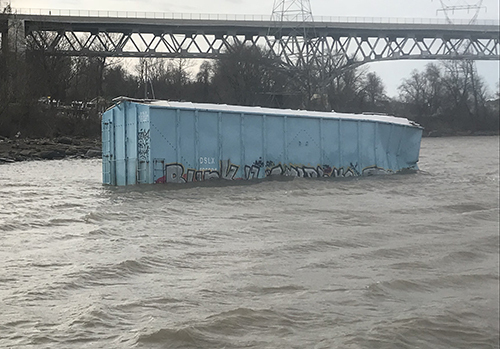 One of the rail cars that fell into the river. Image credit: NOAA. The CSX freight train was heading to Richmond, VA when it derailed between Cecil and Harford Counties at approximately 8:00 pm. The rail cars were empty so no environmental or human health impacts are expected. The cause of the accident remains under investigation. However, strong winds, with gusts up to 40-50 mph, may have been the cause. Federal, state, and local responders are all working cooperatively to remove the rail cars. 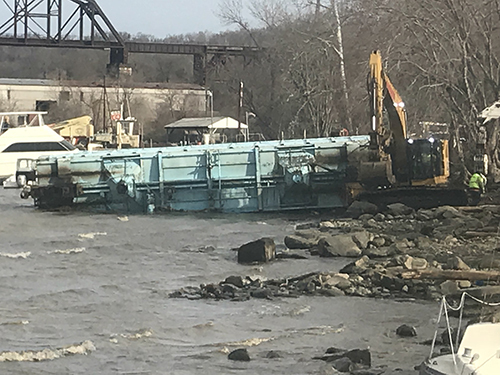 Two rail cars have already been removed and CSX is bringing in crane barges to recover the two remaining rail cars from deeper water. These crane barges are expected to be on-scene by Monday, March 12 to begin removing the two remaining rail cars. The Office of Response and Restoration’s Emergency Response Division has been providing up-to-date weather forecasts to assist the U.S. Coast Guard and CSX contractors. Car from the derailed train being recovered. Image credit: NOAA. A rail car being pulled from the water. Image credit: NOAA.